You are currently browsing articles tagged femininity. “I Will Tell Your Story!" 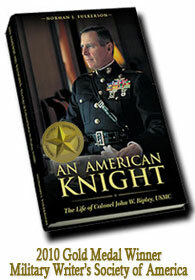 First biography of legendary Marine Corps Colonel John W. Ripley. On November 1, 2008, Ron Darden was watching the evening news when an item, scrolling across the bottom of the screen, caught his eye. He was shocked to find out that his former company commander, Colonel John Walter Ripley, had died at his home in Annapolis, Maryland. On that same day, I decided to write An American Knight, The Life of Colonel John W. Ripley, the first biography of this great man. Sergeant Darden admitted that he was afraid when, as a 19-year-old lance corporal, he first joined Lima Company. He drew guard duty on his first night in Vietnam and described how his fears were put to ease when he received an unexpected visit from Captain John Ripley, Lima Company’s fearless commander, who jumped into the foxhole next to him. The solicitous captain asked Darden where he was from, if he was married and how his parents were getting along without him. During this night visit, John Ripley spoke to Ron Darden with the gentleness of a father and told him it was okay to be afraid, but that he should not let his fears dominate him. Sergeant Darden would go on to earn a Silver Star when he ran out into the middle of a firefight to save the life of a wounded Marine who lay helpless on the ground. He is a man who has seen the worst of war while serving under the best of battle field commanders. Painting by Col. Charles Waterhouse of John Ripley dangling above the Cua Viet River as angry North Vietnamese soldiers fire upon him. What he did on that day defies belief and I could not fail to narrate the Dong Ha story in An American Knight. There is so much more to Colonel Ripley, however, that has been conveniently overlooked or glossed over by those either unable or unwilling to tell the whole truth. Colonel Ripley was a rare type of warrior who willingly and, his sons told me, enthusiastically addressed a number of politically incorrect issues of his day. Ashley Gonzalez of the United States Air force. No comment!!! I saw the importance of one of the issues he addressed when I was “mugged by reality” in an airport some years ago by the sight of a young lady about to board a plane. She was a picture of femininity, in every way, except for her battle fatigues and the rucksack thrown over her shoulder. Moments later, her tearful parents said their final farewells to a daughter being sent off to do a man’s job. It was only natural, therefore, that I drew an enormous consolation when I first read the heroic testimony of Colonel Ripley against sending women, like this one, into harm’s way. While others paid homage to the “god of equality,” he chose to defend the noble ideals of womanhood and femininity. This, and his care for children, were the things which caused me to see in Colonel Ripley a modern-day knight. Since justice is the virtue whereby man renders to each what is due to him, I could do nothing less for this great man. This was one of the motivating factors which urged me to write his life. Mysteriously enough, I was egged on in this project as much by Colonel Ripley himself, as anyone. In a letter to a friend he said something which struck me like a voice from beyond the grave: “If a young officer or Marine ever asks, what is the meaning of Semper Fidelis, tell them my story.” After reading such a thing, I could not fail to tell this man’s story? There was another motivating factor which urged me on and that was my desire to console hero-seeking-Americans who yearn for a role model like Colonel Ripley who they can admire and emulate. During the researching of An American Knight, I took time to read numerous website commentaries and was inspired by the eulogies posted by average Americans. One man, no doubt inspired by the Marines’ Hymn which speaks of Heaven being guarded by U.S. Marines said the following. Another comment was even more impressive but demands an introduction. John Ripley (right) as a Naval Academy midshipman with his brother Michael who died in 1971 while test flying the Harrier. common among many people of higher station. Colonel Ripley was, from top to bottom, a serious Marine Corps officer and was not ashamed of it. Yet he never missed the opportunity to challenge those around him to reach higher. It is for this reason that towards the end of his life he gave himself wholeheartedly to mentoring. He loved to counsel young men starting out on their military careers, especially those of the United States Naval Academy, his alma mater, which he loved with his whole heart. I saved the best eulogy for last. It came from a mother of four, who defined herself, even if inaccurately, as a “simple American women.” I pray that she someday know how moved I was to read her words. I thank you also Colonel Ripley. Rest in peace now, I will them your story. Back cover of An "American Knight". 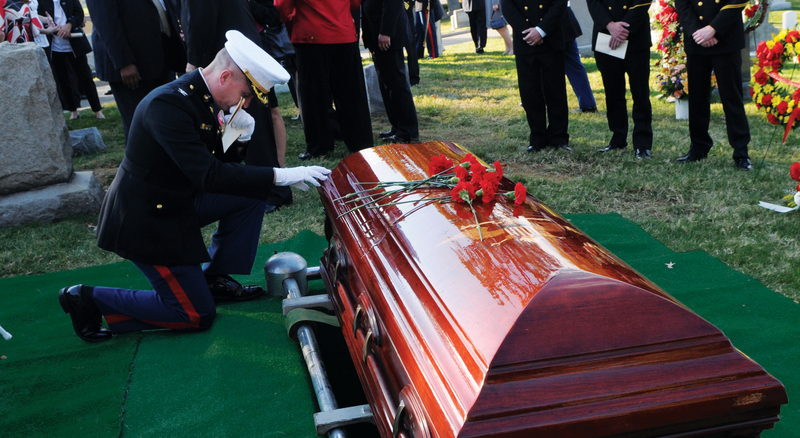 A solitary Marine pays his final respects beside the coffin of Colonel John Ripley.